-First full-length album, out of print for so long, finally re-pressed on CD by Those Opposed Records. -Back in stock! Easily the most promising Black Metal band from Japan at this moment, Those Opposed Records version. -Retrospective album compiling songs from multiple split releases, highly recxommended! -Nice looking underground magazine featuring reviews and interviews with Megalith Grave, Moon, At Dusk, Rudjevit and more. -Black Metal from Japan with Arkha Sva's vocalist. -8 tracks of pure Black Metal terror from Finland. -A history of Russian underground. Old-school Satanic Black/Thrash Metal, a compilation of the material recorded between 1989-1996. -Both bands stretch the limits of experimentation while respecting the ancient structure of raw Black Metal. -Great magazine featuring interviews with Acheron, Asphyx, Iron Youth, Vociferian, Wodulf and more. -Expect some of the darkest music ever put to tape... Artwork by Kogaion Art. -Compilation including remastered debut demo, debut album and many unreleased stuff. -Heathen Black Metal from the United States. -English written magazine from Germany featuring interviews with Ancient Rites, Der Sturmer, Iron Youth, Dark Fury, Arghoslent and more. -English written magazine from Germany featuring interviews with Abyssic Hate, Ad Hominem, Spear of Longinnus, Capricornus and more. -Their first full length, unpolished and bleak German Black Metal. -Eerie and mysterious Black Metal. -Two raw blackened Punk bands gathered on a single cassette. -Darkened post Punk from Florida in the vein of Raspberry Bulbs. -Two new tracks here on this recent demo, no thrills or fancy touches: just primitive and raw Black Metal. -Raw yet melodic Black Metal, three tracks just over 18 minutes. -Raw and melodic Black Metal from Albion recorded on four analogue tracks with no frills or pretence. -Raw and simplistic Black Metal, the first recording from the Autumn sessions of 2013. -Expect no fancy touches or thrills, just simplistic, raw and melodic Black Metal. -The second part of the split... Expect no fancy touches or thrills, just simplistic, raw and melodic Black Metal. -A Swiss Black/tThrash attack recorded back in 2003 which later sectioned off into the cult of Ghost Kommando. -Featuring interviews with Abigor, Har Shatan, Besatt, Skyforger, Angantyr Pagan Heritage and more. -Featuring interviews with Graveland, Shining, Enslaved, Bestial Raids, Animus Mortis and more. -Featuring interviews with Lunar Aurora, Celestia, Pseudogod, Beastcraft, Phlegein and more. -Chaotic raw and unique Black Metal from Germany, a very underrated underground band. -Cold Black Metal from Russia dating back to 1997 with a nasty rehearsal sound. -German underground magazine featuring interviews with Cult of Daath, Goatpenis, Impetigo, Profanatica and more. -Epic battle hymns born on battlefield, the cult continues. -A monumental exploration of human insignificance and mortality, recommended! -Old school Black Metal from Canada and Poland. 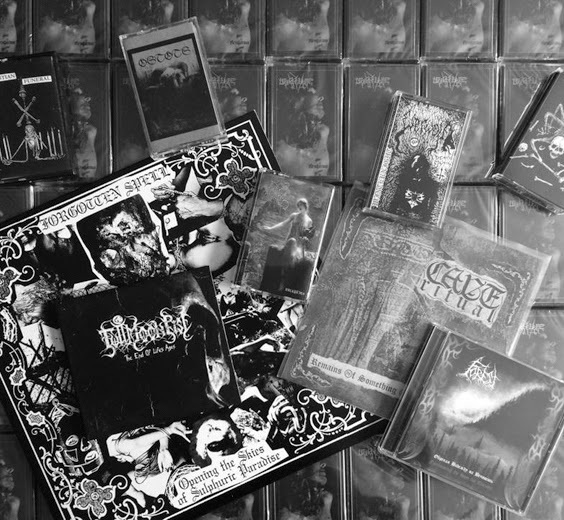 -Compilation featuring this Polish Black Metal horde's older material, highly recommended! -Cult French black Metal, highly recommended! -Haunting Ambient pagan soundscapes from times long gone.. But not forgotten. -American Black Metal highly influenced by the Blaze Birth Hall bands. -Straightforward and dynamic Russian Black Metal released by Horned Tomb Productions. -Lycus have progressed into a style of their own described best as Funeral or Death/Doom, this album will appeal to fans of sincere, dark music across the board. -A manifestation of true Death worship in the shape of dissonant, razor-like riffs, cryptic and convoluted structures, tetanus-made melodies, and hysterical vocal invocations. -Darkened folk ambient soundscapes, surprisingly great. -Desolate atmospheres conjured through keyboards and raw Black Metal, highly recommended! -Incredibly haunting demo of Dark Ambient, field recordings and sound manipulation. -Ancient Russian heathen Black Metal recorded during the snowy winter of early 2013. -43 minutes of Black Metal from the depths of the Kingdom of France, highly recommended! -Excellent heathen Black Metal with folk touches from Russia. -One of the absolute best and underrated US Black Metal bands in existence, vinyl reissue of the 2010 cassette produced by Parasyte Curse. -It's something about lust, something about repulsion, something about inquietude and it's something about anger, it's much about hostility, but above it all, it is something very Polish. -Great raw Black Metal coming from the Basque Country. -Pure Black Ambient Art from France featuring member of Seigneur Voland and Blessed in Sin. -Last and final album from one of the best and most unique Black Metal band from Germany, highly recommended! -Atrocious old-school Black Metal from Russia meets hateful and obsessed Black Metal from Poland. -Back in stock! Silence, solitude, tristesse, desespoir... highly recommended! -Cult French Black Metal split release that was originally supposed to be released by Autistiartili Records. -Pagan Black Metal from France, reissue of the album with Graveland cover as bonus. -Heavy electronics with droning vocals. -One twenty-minute piece of rattling chains, synth-ambience, acoustic guitar and shrieks of tormented agony released on Winterkalt Records. -Proud nordic Viking Metal with some acoustic songs. -Hateful scathing blast of melodic yet primitive raw Black Metal. -Mysterious Occult Black Metal in the vein of Master's Hammer, Rotting Christ and Varathron. -15 tracks of pure Von/Profanatica worship. -Lascowiec side-project, folk heathen ballads. -Anniversary compilation featuring exclusive material from Dead Reptile Shrine, Mons Veneris, Cultus, Grunt and a lot more. -Featuring Seth, Beyond Dawn, Vreid, Tragedy Begins, Abhor and more. -Mysterious Black Metal with slight Punk influences. -Introspective Black Metal album that stays faithful to the epic sounding natural rawness that has been their trademark since the mid-nineties. -Old school Black Metal from Canada, their debut album. -Back in stock! Epic and brooding Cascadian Black Metal from Poland, highly recommended! -Young Death/Doom band hailing from California and making ripples in a big way. -Folk/Ambient from Poland meets Slavonic Black Metal.